The families who have for generations made utensils in the Senke style are called 'shokka'. These days they are generally called 'Senke jushoku'. 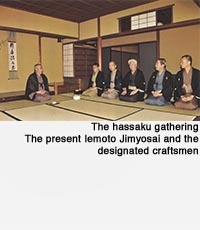 The ten people are : Nakagawa Joeki (metalworker), Okumura Kichibei (scroll mounting maker), Kuroda Shogen (bamboo craftsman and ladle maker), Tsuchida Yuko (pouch maker), Eiraku Zengoro (brazier maker and potter), Raku Kichizaemon (tea bowl maker), Nakamura Sotetsu (lacquerer), Onishi Seiuemon (kettle maker), Hiki Ikkan (papier mache style lacquerer) and Komazawa Risai (woodworker). This term 'Senke jushoku' was first used in the Taisho period, at the time of chanoyu's renaissance, when there was a great increase in demand for utensils. This is what they were called at exhibitions of their work in department stores, and the use of the term has spread up to this day. In the world of chanoyu they are still called 'shokka'. Looking at the history of the word 'shokka', its use was previously not limited to the ten families. Halfway through the Edo period, in the time of the 7th generation Joshinsai and the 8th generation Sottakusai, utensils were made to the Iemoto's design by more than 10 craftsmen families. These families called 'shokka' each answer all of the requirements for utensils in their field, responding to the needs of the Iemoto and of tea lovers. Also, the standard for tea utensils which was based on the form and colour of those designed by Rikyu, was preserved by each of the craftsmen families, with the originality of each age added, and passed down to us today. This is the core of the significance of the 'Senke jushoku'. The craftsmen families who make chanoyu utensils do not just adhere to tradition, but while considering the convenience of the piece to the user and the intention of the person who ordered it, use their own imagination and creative drive to produce something new. In this we see the unique point of view and readiness of the craftsmen against the background of their long history, which is perhaps the difference between them and pure artists.